Massage is great for many soft-tissue pathologies. However, sometimes various conditions exist that seem like a common pathology, but then don’t respond to the treatment. In some cases an undiscovered problem may exist. In this post we’ll take a look at the synovial plica, a cause of knee pain that can easily mimic other common knee conditions. 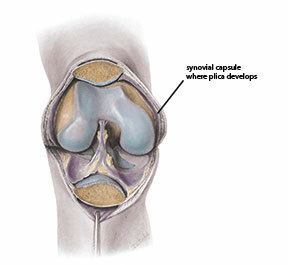 The medial side of the knee is one of the most common locations for a plica to develop. When it develops in this region, it is called medial plica syndrome and may cause pain and discomfort during various movements and is often mistaken for other knee pathologies. While the plica will have existed for the person’s entire life, it may become problematic only later as a result of overuse. The plica becomes swollen and fibrotic for several different reasons. The most common reason for plica irritation is chronic overuse. Repetitive motions of the knee cause friction on the plica and it becomes fibrotic and far less flexible. Depending on its location it can become bowstrung across a bony prominence in the knee. Identifying the presence of a synovial plica is not easy because it can be so easily ascribed to some other pathology. However, there are key characteristics that show up when a plica is present. The primary complaint is intermittent dull aching pain medial to the patella. The pain is usually increased with activity and tends to be more evident during forceful knee extension, such as standing up from a squatting position. Sustained flexion usually increases the pain as the plica tissue is pulled taut. Plica pain generally appears during extension motions, but once the knee is static and held in a position of full extension, such as standing, the pain usually decreases. Additional symptoms may include feelings of giving way, snapping, and popping or clicking sounds especially when moving the knee from 90 degrees of flexion into extension (Figure 2). During palpation it is common to find general tightness in the knee region, especially within the quadriceps group. The fibers of the quadriceps retinaculum are also likely to be tender. There are deep fascial connections between the distal retinacular quadriceps fibers and the synovial capsule of the knee, so reducing quadriceps tightness is a key treatment goal. One of the more common findings with many knee injuries is atrophy in the quadriceps group and this is common with plica syndrome as well. The quadriceps, as an anti-gravity muscle group, is prone to rapid atrophy when there is pain or dysfunction at the knee. Evaluate quadriceps atrophy by using a soft tape measure to measure the circumference of the muscle group just superior to the patella and comparing it with the unaffected side. In some cases there is a distinct taut and palpable band on the medial aspect of the knee that can be rolled under the fingers during palpation of the medial knee. It is not always easily palpable, so this method is not a highly reliant means of determining the presence of a plica. Another method that may be helpful in identifying the plica is a pain provocation test. This can be performed by holding the knee in about 300 of flexion and pushing the patella in a medial direction. Medial movement of the patella reproduces pain as the plica is pinched between the femur and patella.3 Physical examination of the knee alone is not considered highly reliable to identify the plica, so high-tech diagnostic studies such as MRI may be used. The synovial plica is usually treated first with conservative treatments such as physical therapy, which will include stretching and strengthening exercises. Stretching helps encourage pliability of all the soft tissues. Strengthening of knee extensor fibers is an initial treatment because they have fascial connections into the capsular tissues, which helps pull the plica tissue out of the way during extension and prevent it from being pinched.4 It is also very important for the person to reduce offending activities, such as repetitive flexion and extension movements of the knee. Nonsteroidial anti-inflammatory drugs (NSAIDS) are commonly used to address inflammatory activity in the knee. Iontophoresis (anti-inflammatory medication applied with electrical stimulation) and phonophoresis (anti-inflammatory medication applied with ultrasound) can also be used to reduce swelling and manage fibrosis. If these more conservative methods are not effective, intraarticular corticosteroid injections might be used. Surgery is considered the last resort to remove plica tissue. There is currently no research regarding massage treatment for plica syndrome. However, a lack of study does not indicate a lack of a role for massage. To determine the effectiveness of massage for any pathology requires considering whether some form of massage would provide a helpful intervention. We do know that massage is effective in reducing dysfunctional soft-tissue fibrosis in many conditions, and plica syndrome is fibrosis that develops within the synovial fold of the knee joint capsule. It would stand to reason that massage might be helpful in addressing medial plica syndrome by encouraging mobility within the fibrotic or calcified plica. If the plica is caught between the femur and patella, you can push the patella slightly laterally and friction the medial side of the tibiofemoral joint and the area just under the patella. 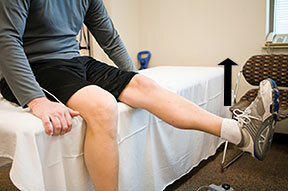 You might also provide some deep friction along other regions of the medial side of the knee. Massage would be generally helpful for maintaining proper muscle tone and biomechanical balance of the VMO and distal quadriceps group so that inappropriate tension levels on the knee capsule fiber do not develop. A critical part of evaluating the appropriateness of massage is to determine if there might be contraindications. In treating plica syndrome, as long as massage is performed within normal pressure levels, there does not seem to be any contraindications to using massage. In fact, massage is more likely beneficial and might reduce the need for surgical intervention. Conservative treatments like stretching and exercise have some degree of effectiveness. Massage may be a useful adjunct for these treatments. This syndrome offers a good opportunity for further research into a new application for massage. Sznajderman T, Smorgick Y, Lindner D, Beer Y, Agar G. Medial plica syndrome. Isr Med Assoc J. 2009;11(1):54-57. Karaman İ, Güney A, Gürbüz K, Bilal Ö, Güney B. Calcific mediopatellar plica: a case report. Eklem Hast ve cerrahisi = Jt Dis Relat Surg. 2013;24(2):117-120. Magee D. Orthopedic Physical Assessment. 6th ed. Philadelphia: W.B. Saunders; 2013. Camanho GL. Treatment of pathological synovial plicae of the knee. Clinics (Sao Paulo). 2010;65(3):247-250.